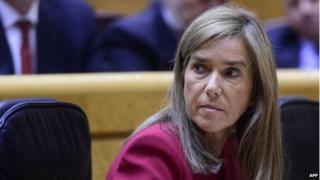 Spain's Health Minister Ana Mato has resigned after a judge accused her of benefiting from illegal payments. Her ex-husband, Jesus Sepulveda, was found to be linked to a huge corruption case involving the ruling People's Party. A court issued a formal ruling which signalled that Ms Mato had no knowledge of any possible crime. The scheme caused a scandal for PM Mariano Rajoy, who apologised after party members were arrested by police. Ms Mato has not been named as an official suspect in the case, but will have to sit in during court hearings, judicial sources have told Spanish press. In a statement, Ms Mato said she had not herself been linked with any crime but that she was standing down for the good of the government. Judges have been investigating the so-called Gurtel network, a huge scheme involving illegal party donations or kickbacks from businesses seeking contracts. It is the largest pre-trial investigation in the history of Spain's criminal court, and involves many Popular Party officials and public figures.